Hasama system, the Citadel region. On the 24th of October 20:30 EVE Standard Time, a Carrier event in the system drew multiple fleets which resulted in a confusing battle that lasted nearly 2 hours. The event was organized by Project.Mayhem. [16-13] who wished to create content in its local area. 5 Archon Carriers were brought into a large faction warfare complex in the system and a defensive fleet of 75 pilots in Machariel Battleships was assembled to protect them. As word spread around of the event, many gangs and small fleets started converging on the system and turning the complex into a scene of chaotic fighting as they collided over the Carriers. and yet, 2 other, more serious fleets organized to take up the Project.Mayhem. challenge. Snuffed Out [B B C] had a 45 pilot Megathron Navy Issue Battleship fleet, while Northern Coalition. [NC] prepared an approximately 60 pilot Sleipnir Command ship fleet. First to arrive to system was the Snuffed Out fleet. It warped into the complex and quickly closed distance with the Project.Mayhem. force, maintaining a 20-30 kilometer range during the fight. The two fleets were quickly caught up in a close range exchange as auto-cannon and blaster charges slammed into primaries. And yet, the Logistics wings on both sides proved more than capable, keeping ships alive in spite of the inferno unleashed upon them. What followed was a long fight where both Fleet Commanders quickly switched primaries, each hoping to catch the others’ Logistics wing off guard. From time to time an unlucky ship would succumb to the insane damage output poured out by each fleet, but for the most part both sides held well. Snuffed Out finally managed to break the stalemate, aiming at the Logistics wing of Project.Mayhem.. 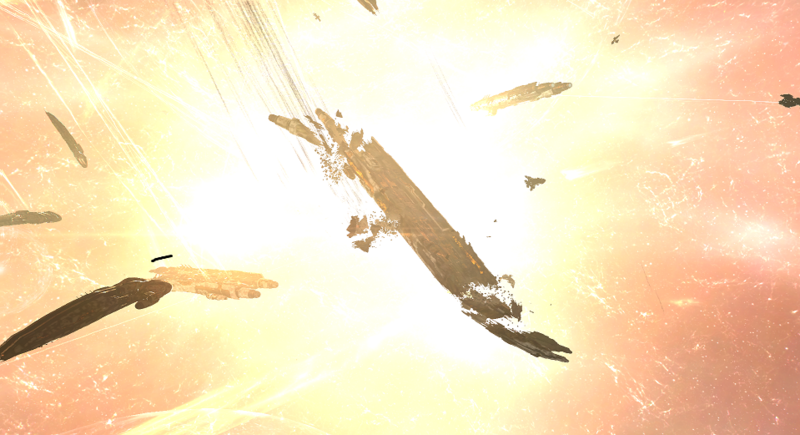 Slowly, Guardian Logistics Cruisers were destroyed, overcome by the massive damage output of the Snuffed Out fleet. With a sufficient number of Guardians gone, the Project.Mayhem. fleet could not tank anymore and was starting to break, a few Machariels destroyed as the Fleet Commander for Project.Mayhem. decided to withdraw, leaving the field for Snuffed Out. With the Project.Mayhem. fleet gone, Snuffed Out set to the task of destroying the Carriers. It soon discovered that the Carriers tanked their fleet only too well, thanks in part to their ability to remote repair each other. Thus the Snuffed Out fleet started the slow task of simply bumping a Carrier away from its friends and out of their remote repairer range. It managed to destroy one Carrier in such way before Northern Coalition.’s fleet entered the system. Northern Coalition. forces attempted to engage the Snuffed Out fleet, warping to the complex and trying to gain range on the Megathron Navy Issue fleet. However it didn’t manage to pull enough range and started to bleed ships. Whats worse was that Project.Mayhem. had re-shipped, returning once more in their Machariel fleet with fresh Guardian numbers. Project.Mayhem. warped this time at zero on the large complex’s beacon. This meant it managed to box in the Northern Coalition. fleet between itself and the Snuffed Out forces. The two fleets briefly collaborated, preferring to focus fire on the Sleipnirs. Finding itself hammered on both sides and unable to pull range, the Northern Coalition. fleet soon started losing ships in rapid succession. After losing nearly a fifth of the fleet, Northern Coalition. Fleet Commanders decided to withdraw, leaving Snuffed Out and Project.Mayhem. to square off once more. However, a repeat of the previous engagement occurred, with Snuffed Out managing to tank the incoming damage while targeting the Project.Mayhem. Logistics wing. After a few bruising exchanges, Project.Mayhem. realized it couldn’t break the Snuffed Out fleet and decided to withdraw once more, leaving Snuffed Out to clear the field. Having defeated all the major fleets in the system, the Snuffed Out force focused on clearing the grid and setting to work on the remaining 4 Carriers. With each Carrier loss, the remaining ones became more vulnerable, unable to tank as much and the rate of their destruction accelerated as a result. After the last one was destroyed, Snuffed Out forces exited the system, having concluded the event. Battle report for the Hasama system can be found here. All told the battle raged for 2 hours with the system hosting an estimated 300 pilots at the peak of the fighting, with Time Dilation not reported as a major issue. During the event no less than 130 ships were destroyed which resulted in 42.27 Bil ISK of damage incurred to all parties involved. certainly like your web-site but you need to test the spelling on quite a few of your posts. A number of them are rife with spelling problems and I in finding it very bothersome to tell the truth nevertheless I will certainly come back again. I have been exploring for a bit for any high quality articles or weblog posts on this sort of house . Exploring in Yahoo I ultimately stumbled upon this site. Studying this info So i am happy to show that I have a very just right uncanny feeling I came upon just what I needed. I such a lot indubitably will make certain to do not fail to remember this website and give it a look regularly. I needed to create you the very small remark in order to say thanks a lot again just for the amazing principles you’ve discussed in this article. This is really incredibly open-handed with people like you giving extensively exactly what a few individuals would’ve marketed as an e-book to earn some cash for their own end, even more so considering the fact that you could have done it if you ever considered necessary. Those basics likewise acted as the great way to recognize that some people have the identical zeal like mine to see a good deal more concerning this condition. I know there are a lot more enjoyable instances ahead for individuals that browse through your site. whoah this weblog is fantastic i like reading your articles. Stay up the great work! You understand, lots of persons are hunting round for this info, you could help them greatly. I really wanted to write a quick message so as to appreciate you for those unique information you are placing here. My long internet research has at the end been compensated with sensible knowledge to write about with my contacts. I would suppose that we website visitors are unequivocally endowed to live in a wonderful network with so many perfect professionals with interesting pointers. I feel rather happy to have come across the web site and look forward to many more entertaining times reading here. Thank you once more for all the details. I just recently began a blog, as well as I was just asking yourself how individuals have promoted their blogs online to obtain even more fans so you aren’t simply typing to absolutely nothing out in the internet?. Oh, and for my blog, I don’t really want my close friends to be my fans, unless they find it on their own. My blog has to do with something that the majority of my close friend’s can’t actually aid me with. (Digital photography is the primary subject). I have been exploring for a little for any high quality articles or blog posts in this kind of house . Exploring in Yahoo I eventually stumbled upon this site. Reading this info So i¡¦m satisfied to express that I have a very good uncanny feeling I discovered exactly what I needed. I most no doubt will make sure to don¡¦t overlook this web site and give it a look on a relentless basis. Just got a Blog owner account, it functions good, yet how do I find different individuals blogs I such as with search. I bear in mind there is a method, however I am not seeing it now. Many thanks for your assistance.